We stock a range of Inlet Air Temperature Sensors to suit a variety of applications depending on the requirements of fitting. 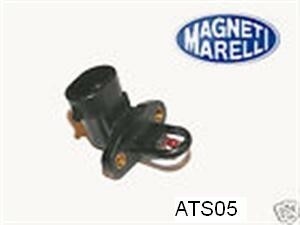 Bolt In Sensor manufactured by Magnetti Marelli. This is a very compact sensor which we use with a lot of our Engine management kits. Its it is affixed by two M3 fixings and can easily be bolted into an airfilter backplate for an individual throttle body setup. This uses a 2 pin Metripack type connector for connectivity. M14x1.5 threaded Air Temperature Sensor - A small screw in type sensor which we use in most of our forced induction applications and our plenum chambers. It has a 19mm hex for screwing into the threads and a 2 pin Minitimer connector for connectivity. Overall length of this is 52mm long. Bosch/BMW Inlet Air Temperature Sensor - M12x1.5mm thread - This smaller bodied but longer sensor that is a direct fit for some BMWs. It has an overall length of 77mm which is ideal for where a longer reach is required. It has a 19mm hex for screwing it in and a 2 pin Minitimer connector for connectivity.